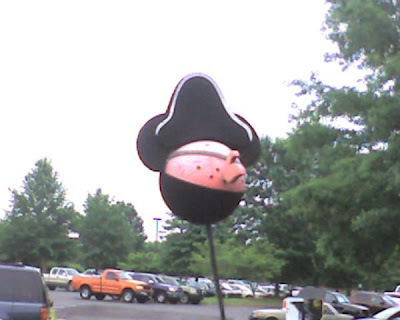 Yeah, when I pulled into the empty parking spot in between an SUV (soccermom using verionwireless) and a minivan, I did a double take when I saw the pirate on the minivan's radio antenna. I felt sorry for them having to ride around so secluded from the world around them, insulated from the sunshine, the wind, the feeling of being alive. No wonder dogs want to stick there heads out of the windows of their owner's cages rolling down the highway. Enjoy the weekend. It should be beautiful riding, watch for the minivan pirates. I'd steer clear of pirate mini-vans, too. After all, they take their kids to "aarrrr" rated movies!